We’re ending 2017 on a positive note. The benefits to communities across the globe keep multiplying as more and more travelers choose to Pack for a Purpose. From 2010 through August 31, 2017, Pack for a Purpose travelers have taken over 93,799 kilos (206,358 pounds) of requested supplies meeting essential needs in over 60 countries. There were significant percentage increases in the amount of supplies delivered in the first two trimesters of 2017 compared to 2016. 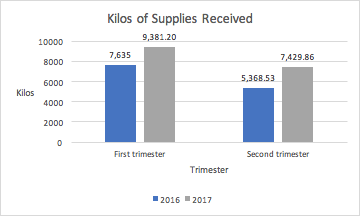 The weight of supplies delivered increased nearly 23% in the first trimester and slightly over 38% in the second trimester! From January through November 2017, our extraordinary volunteers have donated over 2,700 hours of their time and expertise to provide travelers with the information they need to make a Big Impact around the world. In 2017, 48 new accommodations and tour companies became Pack for a Purpose participants. We were delighted to add our newest country in Africa in October, The Democratic Republic of São Tomé and Príncipe. We believe there is a clear correlation between the increase in supplies received by the projects listed on our website and the desire of travelers to make their trips more meaningful. Whether you are traveling for business or pleasure, as a family or on your own, when you choose to Pack for a Purpose, the trip you take goes farther than the miles you travel.